Festival special Carrot colourful halwa. 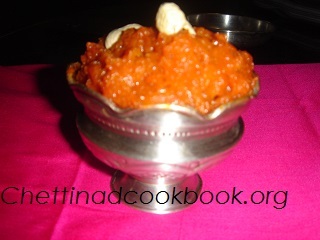 Though carrot halwa has many versions, this is the simplest way of preparation method. It is made with less amount of sugar and fat, normally halwa (sweets) contains more sugar, but this halwa consumes less sugar because of sweetness in Carrot. No food colour is added the natural colour of attractive orange carrot. 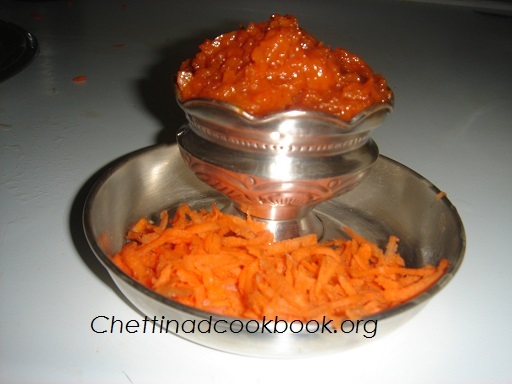 Grated Carrot and grind Badam, cashew to a fine paste by adding little milk or powder. Take a thick bottom pan add Grated carrot, milk, and paste. Cook in medium flame when the stage of 3/4 th cooked add Sugar mix well. Stir continuously for at least 5 minutes in low flame add Ghee it leaves out the bottom of the pan in the form of halwa. Now time to add Pachai karpooram or Elaichi powder mix well and switch off stove transfer to serving bowl.